Japanese mid-tier enterprises (MTEs) and small and medium-sized enterprises (SMEs) are proactively expanding their business overseas with an aim to increasing business opportunities by meeting demand in foreign markets, while responding to the needs of large Japanese companies for local procurement in their global supply chain. 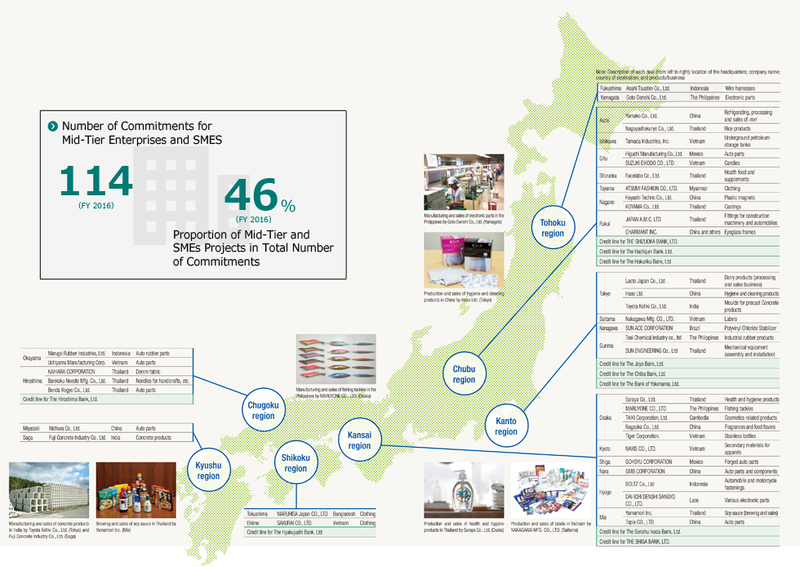 To adapt to the diversifying needs of Japanese MTEs and SMEs, JBIC provides them with not only funding support, but also other various assistance including distribution of information about overseas investment environment and strengthening of partnership with related parties in a project host country by signing a memorandum of understanding with its government agencies and local financial institutions. 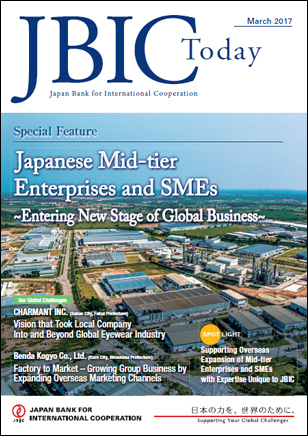 For details about JBIC's key challenges and efforts in the MTEs and SMEs, please see Industry Finance Group. JBIC has signed memoranda of understandings (MOUs) with Japanese regional financial institutions for business cooperation to support Japanese MTEs and SMEs by exchanging information about the overseas business activities of Japanese companies and the investment environment of foreign countries as well as by co-financing Japanese MTEs and SMEs with plans to expand into overseas markets. JBIC has also concluded MOUs with local banks in overseas countries for cooperation in helping Japanese MTEs and SMEs to expand their business into local markets with support from Japanese regional financial institutions. A number of Japanese regional financial institutions have already participated in the cooperative frameworks established by these MOUs. Below is a list of local banks and governments in developing countries which have signed MOUs with JBIC for business cooperation. Please see here for other publications. Export loans support Japanese plant, ship and technology exports. JBIC provides overseas investment loans to meet long-term financing needs of Japanese firms for their international business development, including projects that will establish/expand production bases and develop natural resources overseas. JBIC issues guarantees for loans extended by private financial institutions, public bonds issued by governments and other public entities in developing countries and corporate bonds issued by overseas Japanese subsidiaries and affiliates. Please see here for other support menu.